Building materials (wood in particular) are typically destroyed by three things: water, temperature, and ultraviolet radiation. Water is by far the most important of these three. Since the earth has very high humidity in the soil, it's a very bad idea to have a dirt, vented, or unconditioned concrete crawl space under a home in Vancouver. 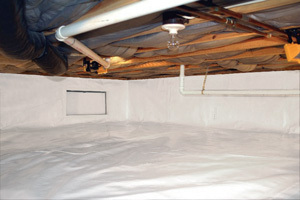 Water vapor is able to move easily into the crawl space from outside, where it is pulled upwards into the home environment. Damp environments are unhealthy and destructive because it's a place where mold thrives and is able to spread by producing millions of airborne spores. A rare few of these spores can actually be toxic - and heating and cooling costs are higher, especially if you have a vented dirt crawl space. 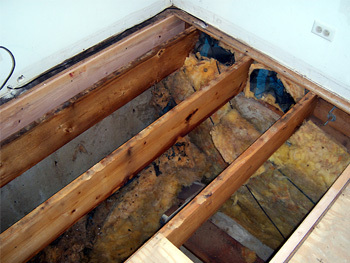 Rot and decay occur in damp environments, causing structural damage. Insects and critters of all kinds (including mice and termites) love damp environments and wet materials. Give us a call now and let our professionals help with your crawl space repair and encapsulation today! We serve Surrey, Langley, Vancouver, Maple Ridge, Coquitlam, North Shore, Delta, and throughout Fraser Valley and British Columbia. Mold spores, odors, humidity, and critters create a very unhealthy environment for people. Many people are allergic to these things, and experience a lot of symptoms and don't realize that their dirt crawl space is affecting their health. Now there is a solution to dirt crawl spaces - The CleanSpace® Crawl Space Encapsulation System - developed by Basement Systems, the world leader in dry basement and crawl space technology. We can help you get rid of your musty odors and smells in your crawl space. 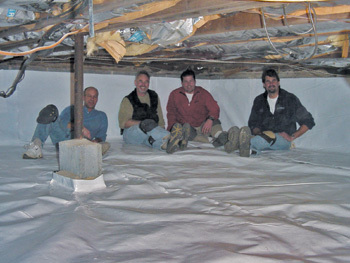 Repairing and encapsulating a crawl space is a huge benefit to your home, and our liner comes with a 25-year warranty! The CleanSpace® crawlspace vapour barrier isolates a home from the earth, reducing the relative humidity level in the air. If you want to reduce, or eliminate mold growth, rot, and critters from your crawl space, lower humidity levels are your solution. This will make the entire house healthier. 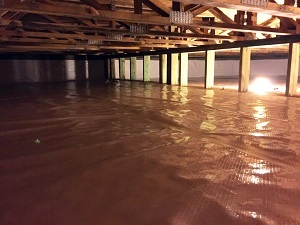 The crawl space liner or membrane is similar to a pool liner. It's made of a heavy 20-mil-thick material. It is manufactured in seven layers - a blend of high-density polyethylene, low-density polyethylene, and two layers of polyester-cord reinforcement to give it incredible strength. The bright white side is placed upward and really brightens a crawl space with the available lighting, allowing for easy inspection and reassurance that your crawl space is free of mold, insects, and dirt. The CleanSpace® liner is tough enough to crawl and store items on -- giving your home extra storage space that you would never have used before! Service people can crawl on it without worry of putting holes or tears in the liner, and they will stay clean -- and they'll love you for it! The liner completely stops moisture penetration from the earth below from rising up into your crawl space. 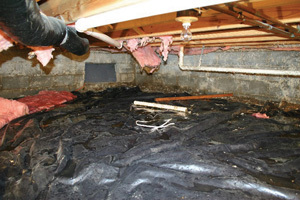 When you're ready to repair your crawl space, Basement Systems Vancouver would like to be there to help you. We service the greater Vancouver area, including Vancouver, Surrey, Langley, Maple Ridge, North Vancouver, Chilliwack, Coquitlam, Burnaby, Port Coquitlam, Abbotsford, Delta, Mission, West Vancouver, New Westminster, Port Moody, Richmond, Tsawwassen, and the surrounding areas in British Columbia.